East Point Shopping is the creation of East Point Inc., a retail real estate development company headquartered in Saint John, New Brunswick. This unique retail development was founded on the forward thinking of local developer Troy Northrup whose determination and vision has made East Point Atlantic Canada’s premier shopping experience. East Point Shopping is located on a series of prominent plateaus dominating the busiest retail community in eastern Canada. The East Point Shopping site was chosen for its central location, remarkable visibility and ease of access from city streets and the nearby Saint John Throughway, Route 1, the single busiest highway section in New Brunswick. In June 2018, the Province of New Brunswick announced plans to build new, and improve existing, highway and street infrastructure in the area. This will lead to even easier access to and from East Point Shopping. The Greater Saint John region is experiencing an economic and cultural renaissance founded on a new era of leadership. East Point Shopping is proud to be playing a pivotal role in this transformational change. East Point Shopping is not a traditional retail development; it is setting a new standard for retail shopping in the region and symbolizes the momentum of positive change in the “new” Saint John. We at East Point Shopping are very proud to call Saint John our home. The process of assembling properties began in 2000 and East Point Inc. was incorporated in 2005 to manage the development and operation of the site. 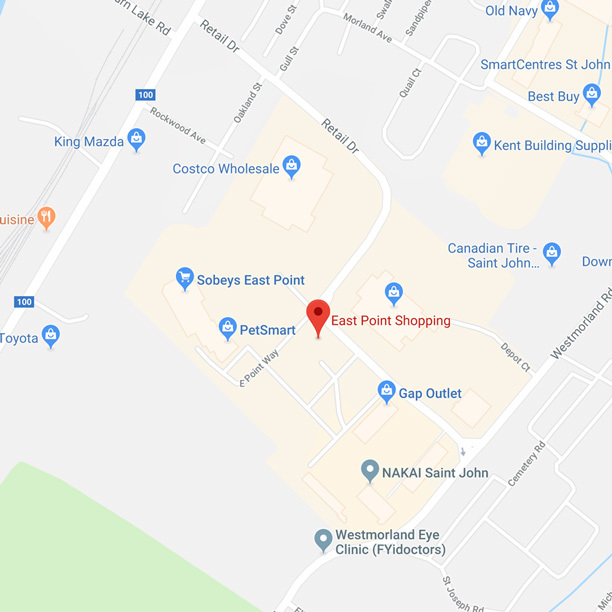 East Point Inc. has assembled a team of real-estate development professionals located in Saint John, Montreal and Toronto to develop, construct, market and manage the East Point Shopping project. East Point Shopping currently has over 80 acres of land under active building development. Anchored by Costco Wholesale warehouse, Sobeys extra and Home Depot, the development is also home to fashion and specialty retail stores and hospitality and business services including Alcool New Brunswick Liquor, FYI Doctors, Cleve’s Source for Sports, Celebrate, Gap Factory Store, Indigo, Montana’s Cookhouse, Expedia Cruise Ship Center, Goji’s Frozen Yogurt, Moores, Nakai Spa, PetSmart, Pizza Studio, Princess Auto, Sally Beauty, Second Cup, Starbucks, TD Canada Trust, Wicker Emporium, Wok Box and a Hampton Inn and Suites Hotel by Hilton. The total building area developed to date is approximately 700,000 square feet with the eventual site build out expected to reach approximately 800,000 square feet of retail, hospitality and service establishments.